Hands up who predicted that result? Liars. In today's Hungarian Grand Prix for far from the first time we were given a reminder that this game can never be said to be predictable no matter how unlikely that can be made to appear. That no matter what it doesn't take much either to set the whole thing in a very different direction. It's odd that we keep needing these reminders. 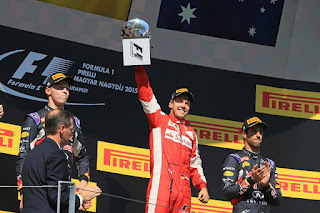 What challenges there were to Vettel evaporated one by one and it was the two Red Bulls, with Daniil Kvyat ahead and getting his first ever podium place, that followed him in to complete the podium. Plenty of adventures happened along the way too. One thing that we forgot as we anticipated what might happen today is that a standing start and first lap shake out can all of a sudden make things look very different. And we had fewest excuses of all for forgetting this part as it made itself felt too as recently as last time out in Silverstone. As was the case then the Mercs today left the line as if with anchors on, and this time it was the two Ferraris that swept by, the four of them four wide at one point. Seb seized the lead around the outside of turn one and while Kimi Raikkonen and Nico Rosberg disputed second place Nico relinquished it by braking a little too late at turn two. No biggie surely? As noted Ferrari had struggled apparently at this track the whole time - most thought its big fight today would be fending off Red Bulls after all - while the Mercs had been crushing in their superiority. Even at Hungary where overtaking never is the work of a moment the 'wrong' would be righted somewhere in this long race, just as was also the case in Silverstone? Nope. 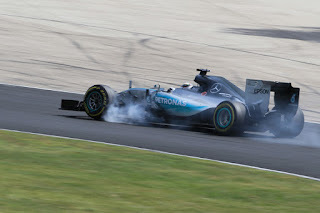 Things quickly went even further south for the Mercs as its talismanic Lewis now in P4 apparently got his braking very wrong at the chicane on the opening tour - or simply closed his eyes, it was hard to tell - and ran across the gravel. Once he'd righted matters he was down in P10, never good news at the sinewy Hungaroring. Lewis did say something about Nico ahead making two moves in defence but those on the outside didn't see much other than Lewis erring all on his own. Thus less than a minute or so in it was like the previous Mercedes preponderance had never happened. Certainly it wasn't now counting for much. 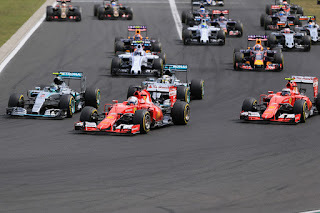 As it wasn't the end of the surprise as rather than backing the pursuing Mercs up as Williams did in Britian the Ferraris actually stretched clear - Vettel of Raikkonen, and Raikkonen of an apparently subdued Rosberg. Come lap 12 Nico had ceded five seconds to Kimi and seven to Seb. A later radio call dashed any possibility that this was all part of a grand waiting-game strategy as Nico revealed that he was peddling as fast as he could to stay with the red team. Lewis meanwhile in the pack while he was making incremental progress was by now half a minute off the red flyers. 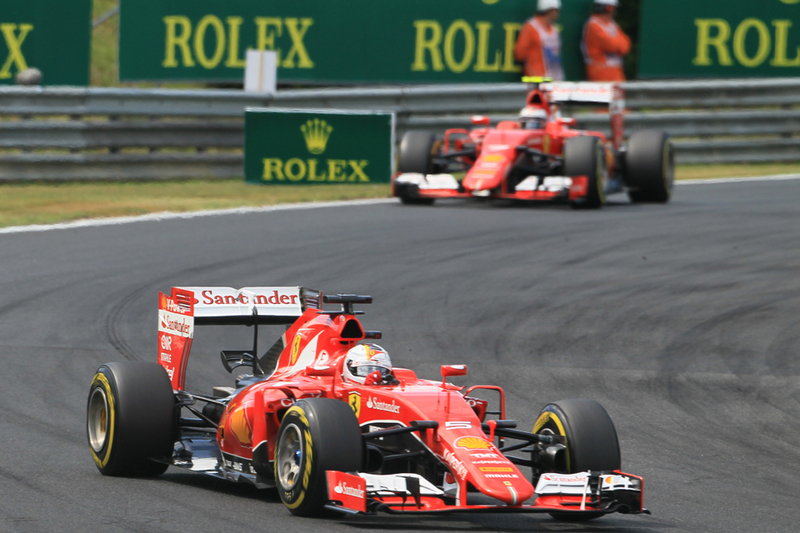 No one was entirely sure where this Ferrari pace had come from. But as boss Mauirzio Arrivabene outlined later it represented a few things coming together. "When you are in front in the open air it is better because you are saving tyres and all these things" he said, "but it's also true that on Friday we had a lot of problems to fix with not enough time to adjust properly the car so we put together a programme, and then we were using the maximum in FP3 and today everything went quite well. "Having the possibility to make our own choice on tyres [meant] the race was quite interesting." A master of understatement it seems. And that's how it stayed for much of the way. Lewis's gradual rise continued and he got up to P4 by lap 29 indeed and then bore in on Rosberg on softer tyres, but never did it look enough to get him with let alone ahead of the Ferraris. But then at around two-thirds distance a couple of things happened to do a lot to get Lewis and everyone else for that matter with the Ferraris. First of all Raikkonen, in a safe second, found his MGU-K fail which seriously clipped his straightline speed and cost him around three seconds a lap (and indeed it stopped him before the end). Then Nico Hulkenberg's front wing collapsed on the main straight sending him into the barriers and out, and the confetti-like debris that resulted from the failure meant first the virtual safety car, then the actual safety car, appeared. Most pitted and the two Ferraris plus Lewis bolted on mediums as they had no choice as they intended to run to the end and hadn't used that compound yet. But curiously Rosberg did the same even though he could have bolted on the much quicker softs for the late sprint. It baffled most of us. "That was an unfortunate situation" explained boss Toto Wolff later, "because at that time our default tyre was the medium. It was 28 laps until the end, and that was too much for soft. "And when the virtual safety car was deployed, when we pitted, that was just the lap where we would have converted the default tyre from the hard [medium] to the soft. But the soft wasn't ready." Yet even with this with Kimi by now easy meat and Rosberg's engineer stating on the radio that the Ferraris have not only tyre warm-up problems but also aren't that quick on the medium tyres generally in the blink of an eye it appeared that the Scuderia's day was unravelling. But just like at the opening get-go the day again looked very different after just a lap of green flag action after the safety car went back in. Daniel Ricciardo didn't make the mistake Rosberg did and on the softs was all over Hamilton at the re-start. Lewis covered the inside of turn one but under-steered horribly on his not yet warmed up mediums and into the side of Ricciardo's Red Bull. The Aussie continued pretty much unabated but Lewis with a damaged front wing sank back horribly and three laps later stopped for repairs. He on top of everything else got a drive through penalty for the clash too. It put him down in thirteenth but to his credit he fought on. Lewis by the end salvaged sixth place from the wreckage but his was a scrappy day and perhaps worse had a touch of the impetuousness that we used to say was his Achilles' heel. Even after his bad start a calm head today likely would have been rewarded with a win, or at the very least second place. Hamilton didn't shirk things, afterwards describing it as a "bad day in the office". When asked what during the race he was expressing regret over the radio to the team about, he replied "the race". Rather summed it up. Almost in spite of himself Nico therefore looked set to make a massive points gain on Lewis, perhaps even enough to get him top of the table. He ran in second with Lewis seemingly nowhere, and even faced a stick or twist situation over whether to attack Vettel for the win. But neither Merc pilot had a good day today. In Nico's case although he kept his nose clean for most of the way his pace was oddly absent, as in clear air at no point did he look like he could cling to the Ferraris let alone get by them. 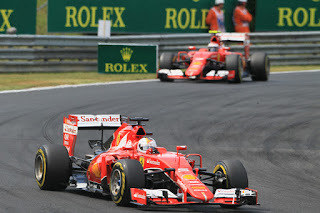 Indeed by lap 37 just after mid-distance albeit on a different strategy he was upwards of 25 seconds adrift of Vettel. Wolff indeed went further than Lewis and described matters for his team today as "just a crappy day in the office". And he didn't have much of a get-out for why the prodigious silver pace was so little seen. "That's two races in a row now that we've been overtaken from the start and everything else came as a consequence. "They [Ferrari] had the fastest car and the best pace, and could have even had a 1-2, but for Kimi's problem, and they deserved to win today." Back in the race Ricciardo now in P3 gave a galling demonstration to Rosberg of what might have been by on soft tyres bearing down on his Mercedes, which by now was shadowing leader Vettel. It was all rather redolent indeed of this very race 12 months ago with Ricciardo tearing chunks out of the gap to an unexpectedly-leading Ferrari and a Mercedes between them. It didn't end the same way though as Nico on a day wherein he'd been governed by caution it seemed then abandoned caution at the very point it would have served him well. Again just like this time last year Danny Ric launched one down the inside of the guy head, this time Nico, at turn one, but it was over-optimistic and he ran wide on the exit. But as Nico sought to move back ahead his rear tyre clipped Ricciardo's front wing, puncturing Nico's Pirelli and requiring Ricciardo to change his front wing too. Again in the blink of an eye the day had swung, this time against Rosberg and to a lesser extent Ricciardo. It was no means egregious by Nico but you wonder if it was imprudent. In another thing redolent of around a year ago, in this case Spa and all that, it looked a clumsy attempt by him to get his elbows out with a rival close by. And in that situation - poised to make a sizeable points gain and in the dying laps - perhaps he should have treated his car as if it was wrapped in cotton wool, as his colleague Niki Lauda used to be prone to say. But Nico looked his gift horse in the mouth and found it full of Greeks... By the time he'd sorted things P8 was his eventual reward and he when the points were handed out had lost four of them to his chief antagonist. And after this Seb was set fair, cruising home to win with Daniil Kvyat second, who as if to sum up the day also got a time penalty of his own added to his race time for passing Hamilton while off the track as part of the post Hamilton-Ricciardo clash jumble (in fairness Lewis was off the track too - and I loved the move for its sheer impudence...) But it didn't alter his end result. 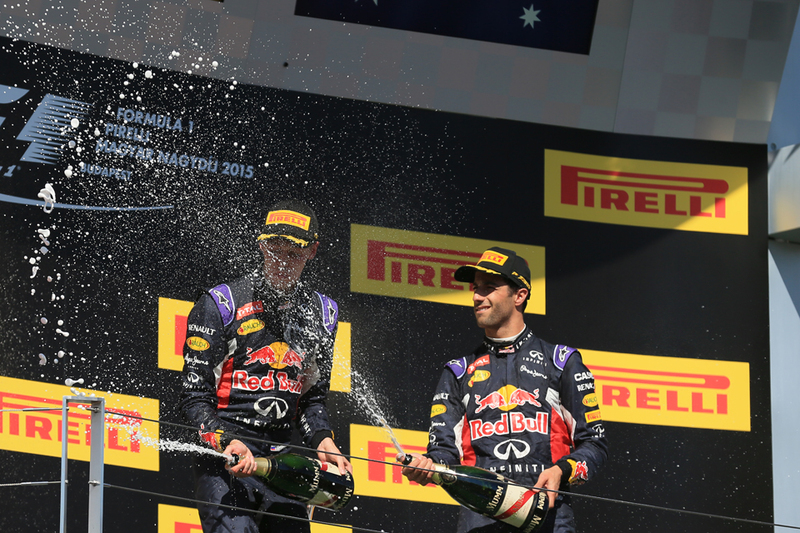 Ricciardo was able to gather it all back together and complete the podium. 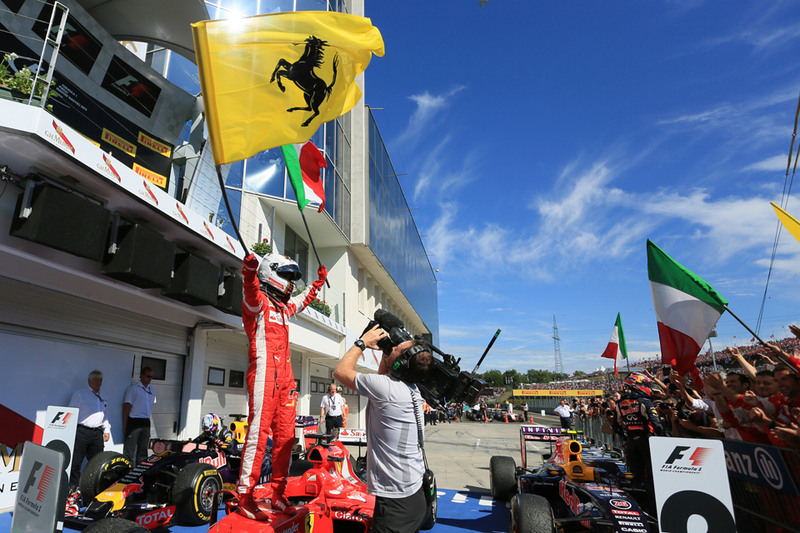 "Incredible day but this victory is for Jules" said Seb. "We know that it has been an incredibly tough week and it's, I think, for all of us very, very difficult, so this one is for him and especially all the people in Ferrari and all the Ferrari we knew that sooner or later he would have been part of our team, part of this family. Cette victoire, c'est pour Jules. "We had a great start and obviously it was crucial to get in the lead straight away. The car was difficult but great to drive and it has been a great race, we showed great pace. Thank you very, very much to the team for the recovery since Friday and today I think it just came together and despite the safety car we still managed to win, so this one is for the team as well." Next home was another unlikely presence in Max Verstappen who was able to pick his way through the mayhem even though he, like the two 'A team' pilots ahead, had a problem to overcome in the race with in his case a drive through penalty (for speeding behind the safety car though the man himself seemed to think it was for a collision with Valtteri Bottas). Someone pointed out too that Red Bull young drivers' programme graduates filled the top four places. Whatever we think of Helmut Marko perhaps we should be grateful for him as on today's evidence hardly anyone would have made the finish without his unique guidance. And if you thought the unlikely results were done we then had one Fernando Alonso finishing fifth. Yes he like a few others benefited from the madcap stuff elsewhere but today it seemed the Woking challenge had a bit more about it, running happily among the midfielders for most of the way. Perhaps like Monaco this was track specific but whatever was so today at least the McLaren-Honda effort appeared to have a flickering pulse and this is something we haven't always been able to say this campaign. 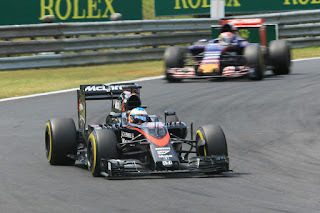 And as we can expect from Nando he was combative and consistently at the limit. 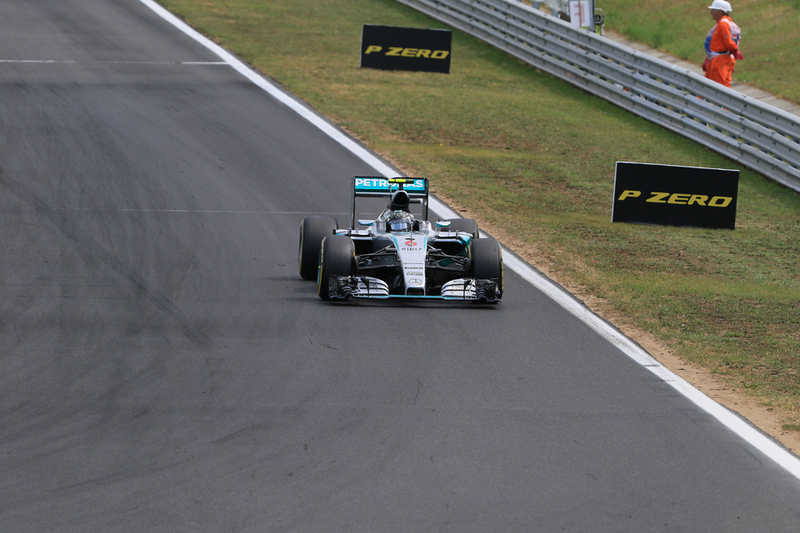 Unlike Rosberg he too benefited from a bold call to put softs on under the late safety car. 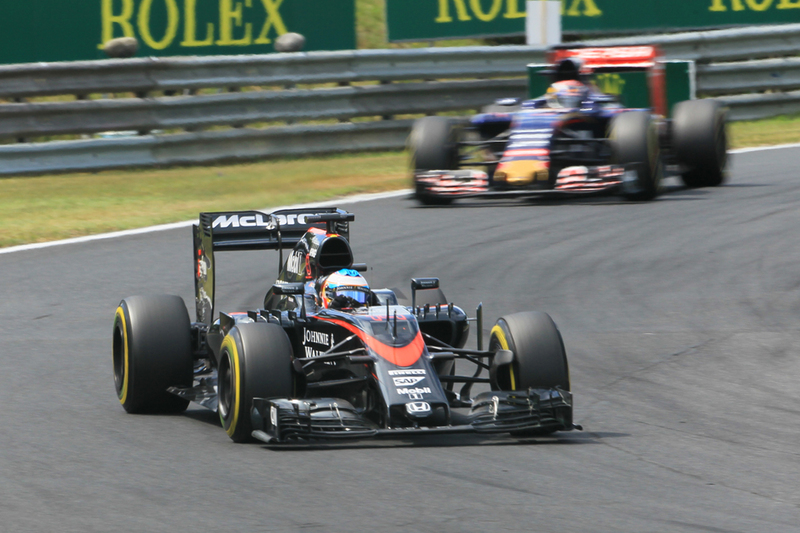 Time was that fifth for Alonso was a ho-hum result. Not today. Kipling had it right: If you can keep your head when all about you are losing theirs...you'll be a man, my son! Well Seb was a man today. No matter what fireworks and carnage took place behind him, and as outlined there was plenty of both, he kept his eyes dead ahead and imperiously led the way straight to victory in that way that he's done so often. There perhaps was something appropriate that in so doing he equalled the Grand Prix win total of one Ayrton Senna. And perhaps the biggest good news story was for the sport as after what seemed a never ending run of lukewarm races we've again almost in spite of ourselves had two very good ones in a row prior to the summer break. Yes they've owed a lot to chance, in terms of shuffles off the start for both and rain for one and a safety car for the other. F1's competitiveness problems haven't suddenly been resolved, neither have its woes over its financial sustainability (see Lotus's adventures this weekend for proof of the latter). But the race as stated was a reminder that no matter what else is going on F1 is not one to reward those who try to state with certainty what's going to happen too far ahead. Whatever else happens to this formula, it's hard to imagine how that will ever be any other way.